Feral, stray, and pet cats are all members of the same species; they are all domestic cats. But stray cats and feral cats are also different from each other in a very important way—in their relationship to and interactions with people. We use the term “socialized” to mean cats who are friendly towards people—or cats who enjoy companionship with us in our homes. Kittens becomes socialized by interacting with people—being held, spoken to, and played with—from an early age. If a kitten does not become accustomed to people holding her and petting her within this crucial window, she will grow up apprehensive of humans and will not be suited to or happy living in homes. Pet and stray cats are socialized to people. Feral cats are not socialized to people. While they are socialized to their colony members and bonded to each other, they do not have that same relationship with people. A stray cat is a cat who has been socialized to people at some point in her life, but has left or lost her domestic home, as well as most human contact and dependence. Over time, a stray cat can become feral as her contact with humans dwindles. Kittens born to feral cats can be socialized at an early age and adopted into homes. Stray cats can readjust to living with people and can be adopted as companions. Adult feral cats are not socialized to people, which means they cannot be adopted. As a result, they are likely to be killed if picked up by animal control or brought to shelters, so it is in their best interest to continue living outdoors. Stray and feral cats can be difficult to tell apart, especially when they are trapped or frightened. Scared stray cats often need time to relax and show their level of socialization. Learn more. Since it is difficult to determine each cat’s socialization during a stressful event such as trapping, it’s a good idea to observe cats on their own outdoors using the guidelines below. Remember that these guidelines are not hard and fast rules and that just one of these traits is probably not enough to draw a conclusion. Bottom line: If a cat you don’t know approaches you or if you can touch her, she is most likely not feral. Not all stray cats will do this though, especially at first—each cat will act differently in a variety of situations. More monitoring using these guidelines may be necessary to determine if the cat is socialized. Will probably have a clean, well-kept coat. A male with a big head and thick neck, muscular body, and/or scars from fighting is more likely to be feral, since these are traits associated with intact males (and only 2% of feral cats are neutered in the U.S.). He may also have a spiky coat from high testosterone levels and less time spent grooming; may also have “stud tail”—hair loss, greasiness, or bumps at the base of the tail due to hormones. A female who is pregnant or lactating is more likely to be feral, since only 2% of feral cats are neutered in the U.S.
Alley Cat Allies recognizes that a cat’s level of socialization and behavior is not always black and white, particularly for feral cats who recognize their caregiver. They may show signs of familiarity, such as a tail up or hanging out on a caregiver’s porch, but these behaviors are usually limited to the cat’s interaction with the caregiver and only develop after building a relationship over time. Always remember: this does not mean that the cat is a good candidate for living indoors. When in a frightening or stressful environment—such as a trap or a shelter—a friendly stray cat may act like a feral cat, avoiding people and possibly even showing aggression to avoid being touched. 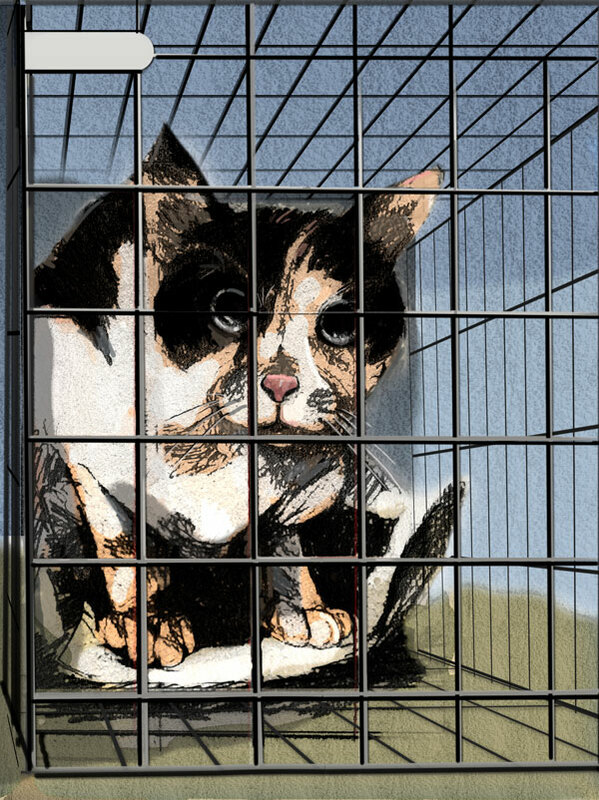 “A lot of cats seem feral in traps but are just afraid,” explains Alley Cat Allies Feral Friend Genevieve Van de Merghel. Who can blame them? The cat is in a new and unfamiliar place. Here are some ways that will help distinguish a feral cat from a scared stray cat when they are frightened, confined, or in a new place. For scared stray cats: Maximize their chances of adoption into a home. For calm stray cats: Find them a good adoptive home. For feral kittens: Socialize them for adoption. For feral cats: Return them to their colony home outdoors.